I have much to report about my visits to colleges in Italy! I stayed in Milan, visiting schools in the city as well as in Bologna and Turin. It was my first time in Northern Italy and I really enjoyed it! I have always loved to visit Italy, but these northern areas feel much more livable and less touristy than the other places I have been. 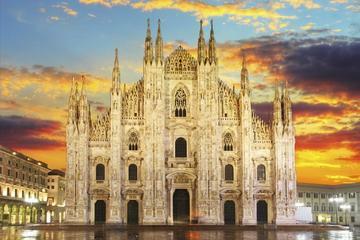 Milan is extremely easy to get around-both as it pertains to the city and getting elsewhere in Italy and Europe. I was able to get to Bologna and Turin in an hour by train. You can get to Lugano, in Switzerland, in under 90 minutes and Rome in under three hours. That said, the train travel is not inexpensive. My flights from Paris to Milan and Milan to Sofia, Bulgaria, were both less expensive than my train travel within the country. There are three airports in the region with many low cost airlines. More than any other country I have visited, I was struck by the differences between the public and private colleges in Italy. The public colleges in Italy charge tuition based on family income to all students, including international students, with a maximum tuition at most schools of under 4,000 Euros per year. While this may seem attractive, the facilities of the public colleges in Italy I visited were quite basic, and large lectures are customary. I was told that students have to be prepared for less services directed towards their growth and development, as the main focus of these schools is educational. Certainly the trade offs are worth it for some, but not for all. I want to emphasize that this is not the case in most other countries. In fact, I am often more impressed by the public universities than private ones elsewhere. There are unique obstacles when applying to colleges in Italy. The first applies to master’s and bachelor’s degree students applying to both private and public universities. It is a headache called “pre-enrollment”. This procedure was put in place in the days before internet and has not changed with the times. First, a student applies to a college in Italy. The school then issues a pre-acceptance letter (or rejection). The student takes the the pre-acceptance letter along with a ton of other required documents to the Italian embassy in their home country for pre-enrollment. This also begins the visa process. The student is officially enrolled once they are in Italy in the fall and turn in their documents to the school. But wait-it’s potentially even more complicated! Some undergraduate programs have an entrance exam. SAT and ACT can substitute for many of them, but not for all. For instance, all the medical programs require entrance exams as do programs like architecture. Private universities tend to offer their entrance exams in the spring and often offer them in cities around the world. Public universities generally offer theirs on campus in Italy in September. And by September I mean a mere month before classes begin. This would personally make me really anxious from a planning perspective! Finally, the Italian government requires that American students have either an IB or 3 AP scores of 3+ to enroll in bachelor’s programs. This is because Italian students have 13 years of education, while we have 12 in the US. A full year of college can substitute for the AP requirement and some schools allow 3 academic college courses to substitute. Word on the street is that the government is considering getting rid of the pre-enrollment process and looking at other ways to assess educational equivalence besides the APs. Fingers crossed! While I learned a lot at each of the colleges in Italy I visited, one school really stood out and excited me. The school is University of Bocconi in Milan. 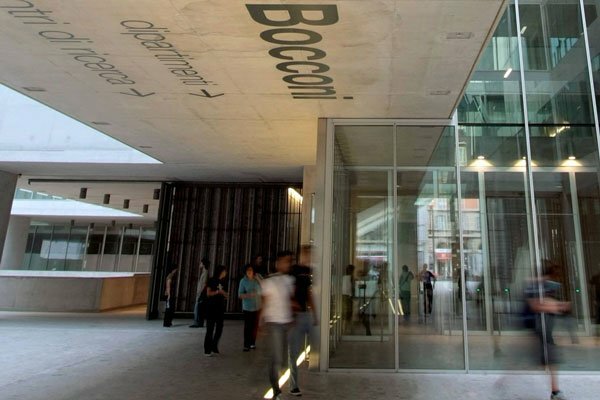 Bocconi was founded in 1902 and focuses primarily on business and economics related programs. They offer English taught bachelor’s, master’s, and MBA programs. The majority of the programs are taught in English and the longer term goal is to have all of their programs taught in English. What really struck me about Bocconi is the international approach they take to education. This is something that is easy for schools to say they do, but Bocconi really backs it up with resources. Traditionally, higher education in Italy has revolved around lectures with little interaction between students or students and the professor. This is still the case at many public universities. For the past 15 years, every professor that has been hired at Bocconi is fluent in English and is either a non-Italian or an Italian who received their Ph.D in an international program. This creates a team of professors who are not resistant to an alternate educational model and are more international in their approach, as opposed to strictly Italian. Each entering class of the different programs is split into classes of no more than 100 students so even the largest lecture does not exceed that number of students. Even for lectures, the classroom layout was intentionally designed to be conducive to an interactive environment. Each department has a dean, program directors, and course directors to serve as resources to the students. In addition, each student has an academic advisor. Because Bocconi has strong connections with the business community, guest speakers from the field often speak in classes which provides a bridge between theory and practice. Though the campus environment is international itself, with over 90 nationalities represented, Bocconi sees the value of providing students opportunity for further international exposure throughout their studies. In addition to the opportunities through Erasmus, Bocconi has 275 bilateral agreements with schools around the world. This allows students to study outside the EU for no additional tuition fees. Their partner schools in the US include Princeton, Columbia, Duke, Georgetown, NYU, Northwestern, and University of Chicago, in addition to 47 others in the US and equally impressive names throughout Latin America, Canada, Asia, Austrailia, New Zealand, and the Middle East. Students are advised strongly to study abroad and it is mandatory for some of the programs. Bocconi offers seven English taught bachelor’s programs (3 years), eleven master’s programs (2 years), three specialized master’s programs (1 year) and eleven English taught MBA and post-experience education programs. Almost all of the programs are related to Economics and Management, with program options that integrate these areas with social sciences, computer science, finance, arts, culture and communication, government, fashion, healthcare, and more. In addition, there is a bachelor’s degree in International Politics and Government and a L.M program in the Law of Internet Technology. They also offer a four year World Business Bachelor’s degree programs in which students spend the first year studying at USC, the second year at Hong Kong University of Science and Technology, the third at Bocconi, and choose where to attend their fourth year. Students graduate with a full degree from all three universities. The tuition for the bachelor’s degree programs is $14,150 per year (other than World Business which varies based on the school), master’s degree programs are $15,347 per year and MBA/post-experience programs start at $28,300 per year. Bocconi offers need based scholarships of full tuition for the length of the entire program. There are also merit based scholarships offering a full tuition waiver and with free housing for the first two years and one option that provides a 50% reduction in tuition. Applicants are automatically assessed for the merit scholarships upon application. The need based scholarship requires a separate application. In addition, Bocconi has a FAFSA number! This is a huge advantage to American students as it allows them to utilize US funding options for college in Italy and use their 529 savings without penalty. Bocconi has resources and structures to support their students growth and development outside of the classroom as well. It is a centralized campus that even provides housing-most of which is on campus! They currently have seven student residences with an eighth opening the summer of 2018. Rooms are single occupancy and range from 600-700 Euros per month. They are also building an updated rec center which will be complete in 2018. Bocconi currently has a lacrosse team and soccer team as well as intramural and other options for track, hiking, judo, basketball, volleyball, boxing, rugby, skiing, snowboarding. and tennis. There are a number of student associations pertaining to various interests outside of academics as well as a student media center which includes student radio, web TV, and newspaper. Bocconi offers extensive student services including a counseling department that provides individual counseling as well as support around acclimating to a new country, time management guidance, and other challenges students may be facing. Bocconi has a dedicated department of other 70 employees who work on job and internship placements. This department size speaks to the focus Bocconi puts in assisting their students in finding internships and jobs. Though the majority of students who graduate from the bachelor’s degree programs go on for a master’s degree, the job placement department has a dedicated team to help undergraduates with internships and job placements. 96.4% of the graduate students are employed one year after graduation, with 51.2% of them employed abroad. Top recruiters include Accenture, Goldman Sachs, Google, L’Oreal, J.P Morgan, Microsoft, Morgan Stanley, the United Nations, Deloitte, Ernst & Young and many more! As I have mentioned many times before, it is crucial that we look at quality indicators beyond rankings-whether looking at schools in the US or colleges in Italy. I believe that these quality indicators include a classroom environment that fosters interaction and cultivation of critical thought, international exposure, development of skills needed for employment, student supports, and outcomes pertaining to employment. Bocconi checks all of these boxes and more. Though it is not one of the least expensive schools in Europe, it is still comparable to in-state tuition fees when you factor in the difference in duration. Further, there is a very favorable probability of a high return on investment as it pertains to learning, employment, and personal growth.